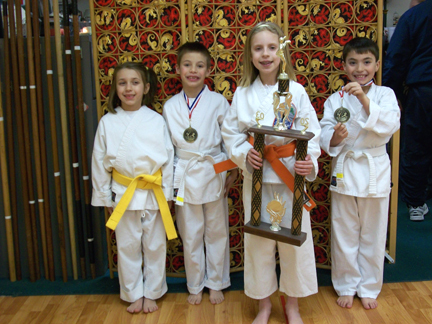 Congratulations to the Isshin-ryu School of Karate place winners at the Golden Rule tournament, 2/14/2010 at Warren Hills Regional High School, Washington, NJ. The thoughts that pass through the mind are responsible for everything that happens in life. As the thoughts are, so is one’s life. To make changes in life it is necessary to change old thinking and replace it by positive thought and insight. Using the power of thoughts effectively can be termed “practical daydreaming”. The power of thought is creative. It is possible to train and strengthen it. Visualize a perfect scene of whatever you want to accomplish. Put as much detail and imagery into the mental image. Revisit these mental images often and accept the positive outcome and they will come true because the mind does not know what is imaginary or real. It only knows what we think and believe. Thoughts that pass through the subconscious mind influence actions in accordance with these thoughts. Training individually and in the dojo during class enhances our ability to think, develop positive thoughts and capabilities. As training is started the student is often hesitant because what is being taught is foreign and new. Fundamental skills are taught and practiced in each class. This repetition of foundation skills is not unique to traditional karate training but it has been lost in many dojos, schools and the work place because the emphasis today is placed on being fast without much emphasis on proper technique; getting the product done to make money is more important. With the proper foundation, the advancement through higher skills is found to be less stressful and combination of skills is also understood with better insight. 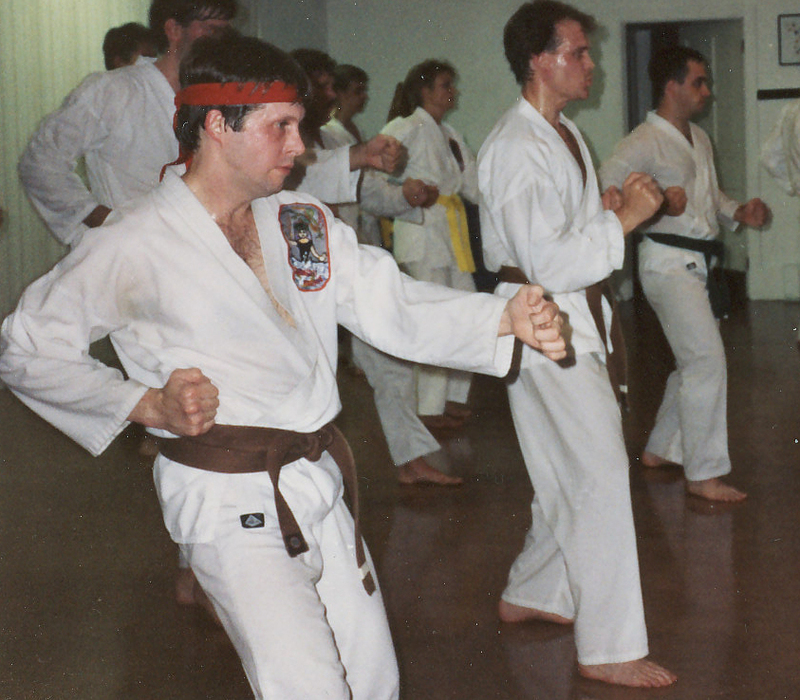 We must first learn the movements and the proper direction in which the kata or sparring drill is done. Then breathing correctly, inhaling while in transition and exhaling while blocking or attacking, is necessary for power to eventually be developed. Next an added component to breathing is the Kiai and methods to tighten the body, adding strength and power to the techniques and focus of power at the appropriate times. As understanding of the possible meanings for each move (bunkai) and combination of moves is developed, timing is also heightened so the moves in kata may be used in kumite and self defense applications. As is evident in this brief thought, proper traditional karate training may last a lifetime and still be challenging and exciting. If one strives to understand each aspect of the art, individual successes will be experienced. These successes will also transfer into daily life, which is an added benefit to proper training. HANSHI’S AFFILIATION SEMINAR – hosted by the Carmona’s this year in Mt Arlington – – Thursday, June 24, Friday, June 25 and Saturday, June 26 for adult Brown and Black Belts in his Affiliation. ADULT STUDENTS SEE KYOSHI TO GET MORE INFORMATION ABOUT MARCH AND JUNE’S SEMINARS. PLAN TO ATTEND. The date for the 2011 IWKA Isshinryu World Karate Championships is Saturday June 25, 2011. Seminars will be conducted the 23rd and 24th. At the request of O’Sensei Kichiro Shimabuku the 2011 tournament will be held in Indianapolis Indiana and honor the late Sensei John C. Lennox. The tournament information website is www.isshinryu2011.com this site links through our homepage at www.indybushido.org. FRIDAY PURPLE, BROWN AND BLACK BELT TRAINING DATES: FEBRUARY 19, MARCH 19, APRIL 16, MAY 21 – – Check you calendars and plan to attend The cost is only $5.00. Let Kyoshi know if you will be attending. OUR 25TH BENEFIT TOURNAMENT IS APRIL 25, 2010 AT HACKETTSTOWN HIGH SCHOOL. WE WILL NEED HELP FROM PARENTS, FAMILY MEMBERS AND FRIENDS. SEE KYOSHI. People who joined the AOKA, Inc. Organization prior to November your renewals are due as per the following. Any student may join this organization. Its intention is to help unify Isshin-ryu Karate regardless of the organization with which the sensei or dojo is affiliated. The AOKA, Inc 2nd “Day With The Master’s Seminar” is scheduled for Saturday, March 20th or 27th (adults only). 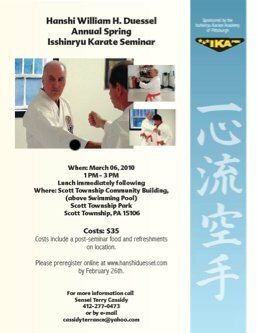 This is a series of seminars conducted by Masters of Isshin-ryu Karate. The first series of seminars lasted about 5 hours and was reasonably priced. The information related was extremely beneficial. More information will follow. Let Kyoshi know when you renew or if you wish to join. 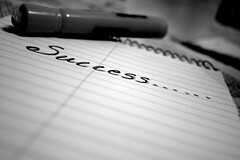 Read this month’s article, THOUGHT, SUCCESS, & REALITY. The first karate tournament of the year is at Warren Hills High School – – Sunday, February 14th. I hope many of you will be able to attend. I have pre-registration forms. 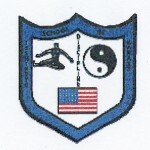 Sensei Doug King’s sparring tournament is Sunday, March 14, 2010 at Newton H.S.